BlytheLife.com » QOTW: How long is too long for an outfit? QOTW: How long is too long for an outfit? much since forever. But isn’t it great on her? I would be the first of many to admit that I leave my dolls in the same outfit for days, weeks, and months on end. Poor things. But sometimes I just find the ‘right’ outfit for a doll and it just looks great on them and I just don’t want to change them! Plus, finding a new ‘right’ outfit can be time consuming. 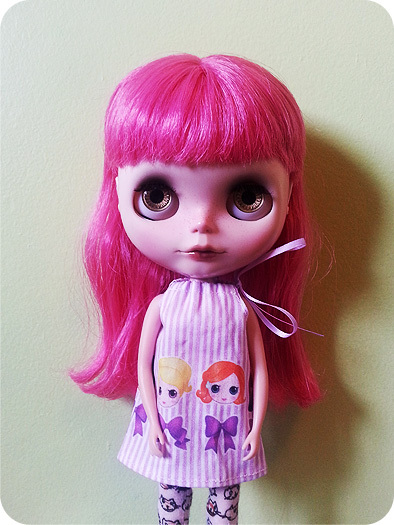 Luckily, Blythes tend to look great in everything, and I also have the tendency to buy (or craft!) clothing items in a manner that curated a wardrobe that, in general, goes well together. 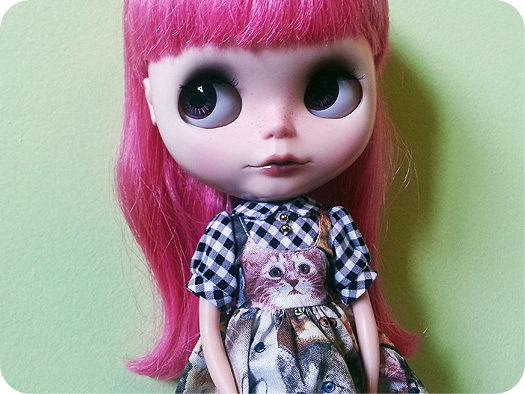 BlytheCon Vancouver 2015 fabric, her kitty tights are by Endangered Sissy. There are certain dolls in my collection that just don’t get a lot of “play” time. This isn’t because I don’t love them, I do, it’s because there’s just some aspect of them that makes general handling a challenge – this is mostly in reference to the thick, heavy, always-in-my-way hair that some of my dolls have. But sometimes I’ll take one of these troublemakers off my shelf and pop them in a new outfit… Mostly because I’ve realized that they’ve been in the same dress for at least half a year. Or more. I’m such a bad dolly owner sometimes. QOTW: What is your current favourite outfit? QOTW: Any ‘themes’ to your dolls?